EK Water Blocks EK Vector RTX Titan - Acetal + Gold :: ..:: Angela.pl ::.. The EK-Vector RTX Titan is a special edition run of the full cover EK-Vector series GPU water block. The EK-Vector RTX Titan is aesthetically designed for the best fit with NVIDIA® RTX Titan ™ high-performance graphics cards. 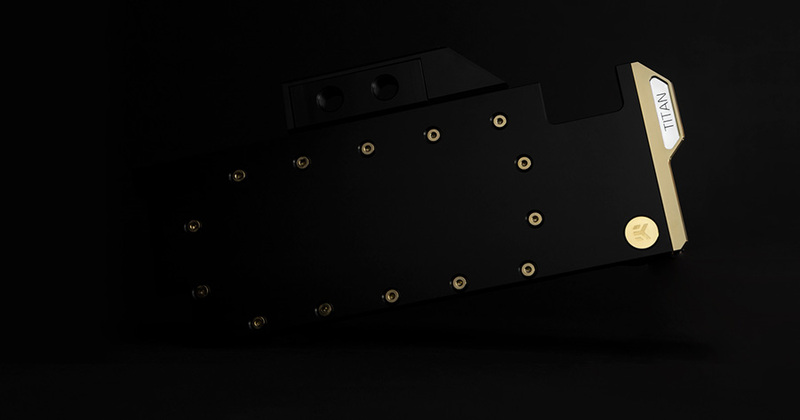 It features a performance tweaked gold plated cold plate, acetal top cover, gold plated screws, and a special RGB lit gold plated aesthetic end piece. The EK-Vector RTX Titan also fits multiple NVIDIA® GeForce® RTX 2080 Ti graphics cards. The water block itself uses the signature EK® single slot slim look, and it covers the entire PCB length. This sophisticated cooling solution will transform your beefy graphics card into a minimalistic, elegant piece of hardware. The block also features a unique aesthetic cover over the block Terminal which is designed to reveal the graphics card model, visible from the side. The water block directly cools the GPU, VRAM and the VRM (voltage regulation module) as cooling liquid is channeled directly over these critical areas. This special edition water block features a redesigned cooling engine that has a larger footprint compared to the previous generation of EK® Full Cover water blocks. This results in a larger surface area for heat transfer which increases the thermal performance of these water blocks. The base of the block is CNC machined out of gold plated electrolytic copper while the top is CNC machined out of black POM acetal material. Sealing is ensured by high-quality EPDM O-Rings. The brass standoffs are already pre-installed and allow for a safe and easy installation procedure. The front aesthetic corner piece is lit up with a special LED light diffuser. This product is compatible with popular RGB sync technologies from all major motherboard manufacturers. The arrow marking on the 4-pin LED connector is to be aligned with the +12V marking on the RGB header. G1/4" threaded fittings can be used on both sides of the terminal and for multiple GPU connectivity, please refer to our offer of GPU Terminals. 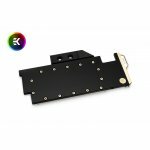 The EK-Vector GPU water block terminal cover is not compatible with FC Terminal X and FC Terminal (Legacy) multi GPU connectivity bridges.